Aside from chewing on everything she can get her hands on, I am pretty sure Ayla’s favorite thing to do in the world is to read. One of MY favorite things to do in the winter (when we are getting a bit stir crazy) is pack a bag with a few books and head to Starbucks for a little coffee date with Ayla. I get my caffeine and she gets a tiny scone with a side of books so we are both happy. We were so excited when we found Kathryn O' Brien’s adorable kid’s books. They are published by Tyndale Kids and have the sweetest little messages. These books take a bible verse, word by word, and help your kids to memorize scripture as well as to learn about the meaning of the verse in a deeper way. 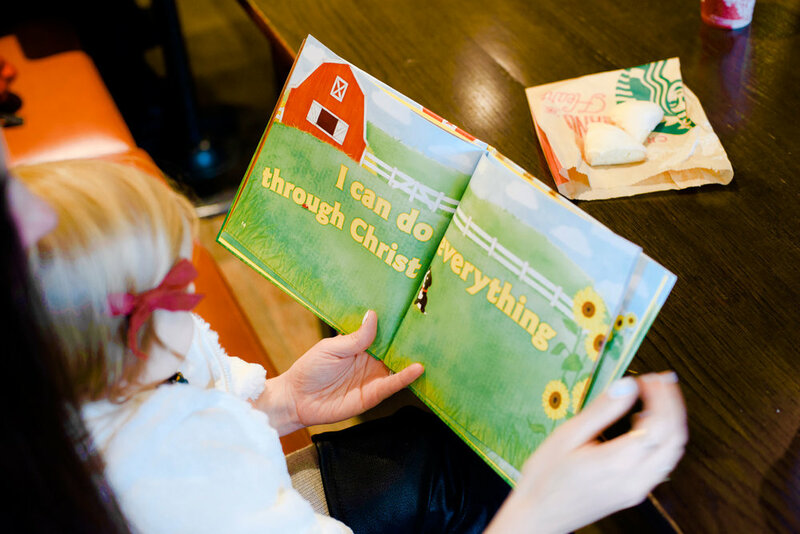 The book I'm currently reading to Ayla is called "I Can" and it’s all about Philippians 4:13 ("I can do everything through Christ, who gives me strength."). I know as a mama my greatest hope for Ayla is to know and love Jesus. I realize I can't ultimately control if she will come to have faith in Christ but I know the impact scripture can have on a tiny heart. Memorizing verses has always been very difficult for me as I have a terrible memory but it’s been such a valuable part of my walk with Jesus. I want Ayla to have tons of little verses stored up in her mind to help her navigate through life in a way that always leads her back to joy in Christ. Anything that makes memorizing verses easy and fun is such a win for us! These books are not only adorable and a fun read but they are a great resource for helping toddlers and young kids memorize scripture. I would highly recommend checking them out! They are a great way to invest in your kid’s lives as well as their libraries! You can check out her other books on her website at www.Kathobrien.com.